James Arness, Bob Hope, Jane Russell, comedian Jerry Colonna and singer Sue Raney raised $15,000 before a standing room only group of 6,000 at a benefit show in June ‘59 for the Aquinas Newman Center building fund in Albuquerque, New Mexico. 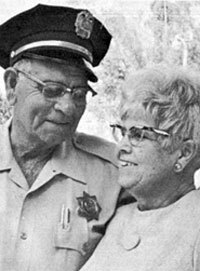 Arness is shown here with Albuquerque city patrolman Bill Castleman. 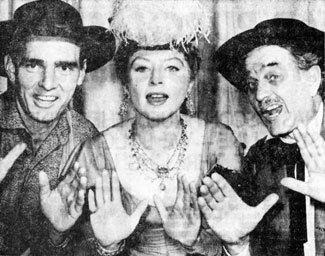 Dennis Weaver, Amanda Blake and Milburn Stone were guest stars in September ‘59 at the New Mexico State Fair in Albuquerque, New Mexico. 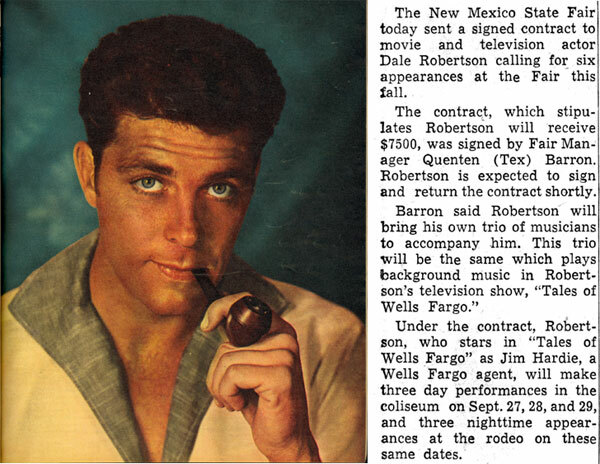 TV’s “Zorro”, Guy Williams, was in Albuquerque, New Mexico June 19-21, 1959 appearing at the Greater New Mexico Sports Show. 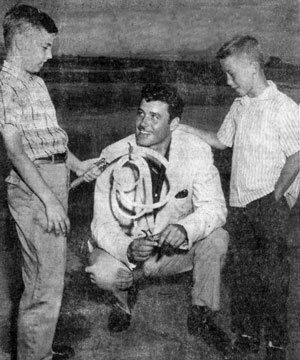 Dennis Crosby (left) and Rusty Strong presented Williams with an authentic bullwhip. 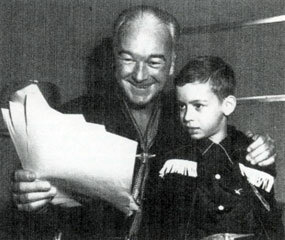 Hopalong Cassidy shows a young fan the script for his next radio broadcast. 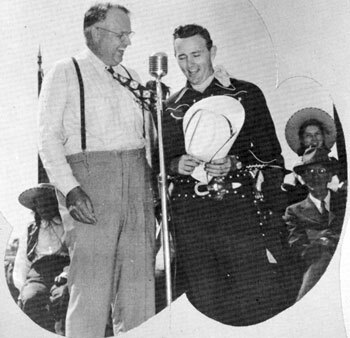 Oklahoma Governor Robert S. Kerr and Jimmy Wakely sing a duet and do a little kidding at the dedication ceremonies of a Chisholm Trail marker in Enid, Oklahoma in the mid ‘40s. Kerr was Governor from ‘43 to ‘47. 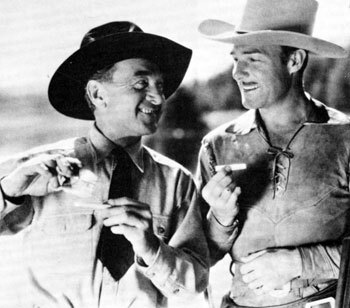 James “Maverick” Garner with his brother Jack Edward Garner. 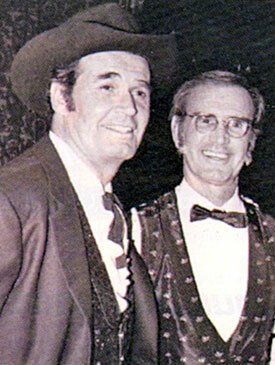 Jack appeared in more than 60 episodes of the “Rockford Files” as well as small parts on “Daniel Boone”, “Gunsmoke”, “Bret Maverick” and “Maverick”. Jack was a former minor league baseball player for the Pittsburgh Pirates and one-time singer in the house band at the Coconut Grove in L.A.
Jack Hoxie’s brother Al Hoxie was a minor star of some 20 silent Westerns and later became a Sergeant and Chief Security Officer at Patton State Hospital in San Bernardino, California. 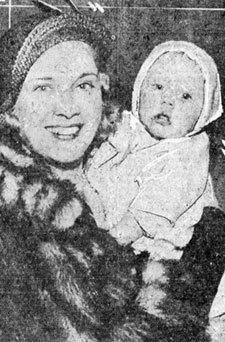 His wife Marie is shown here with Al. 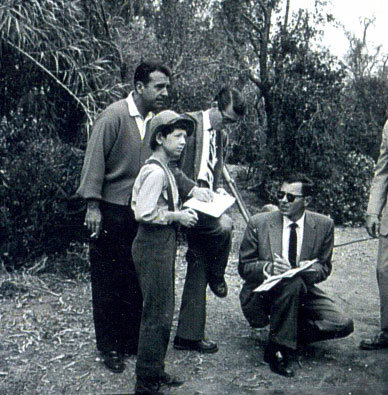 Preparing to shoot a scene for “Buckskin” (‘58) are young star Tommy Nolan and a couple of production people. Singer Tennessee Ernie Ford looks on. 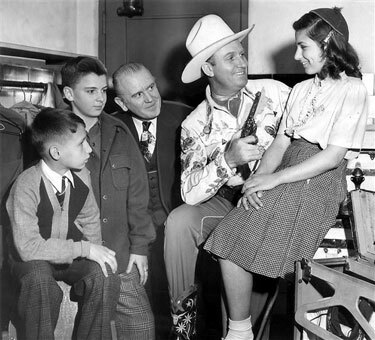 “Buckskin” was originally the summer replacement for Tennessee Ernie’s popular TV series. 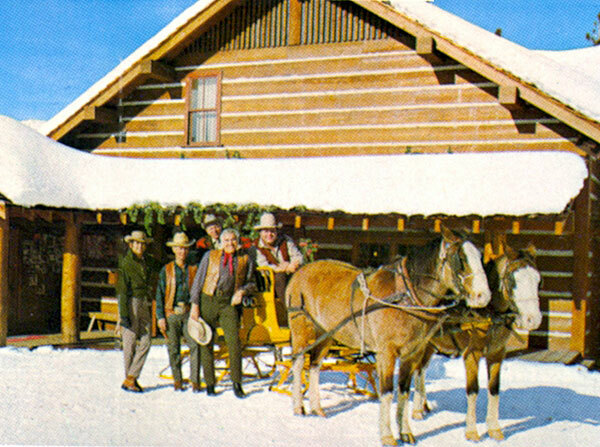 A snowy scene at the Incline Village “Bonanza” house in Lake Tahoe, Nevada with Michael Landon, Lorne Greene, Dan Blocker and a couple of others. 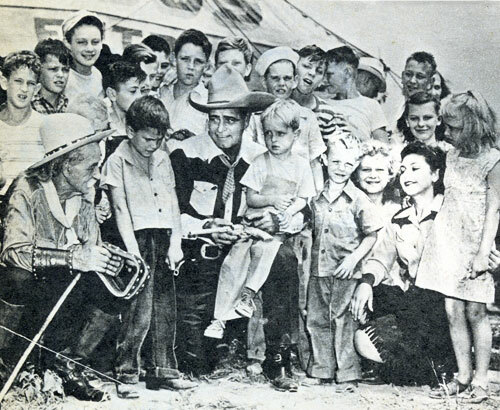 In the ‘50s Tex Williams and the Western Caravan were stars of a Tuesday night at 9pm KNBH-TV (now KNBC Hollywood) musical jamboree. Tex is front and center with his guitar, Smokey Rogers and Deuce Spriggens are to his left. 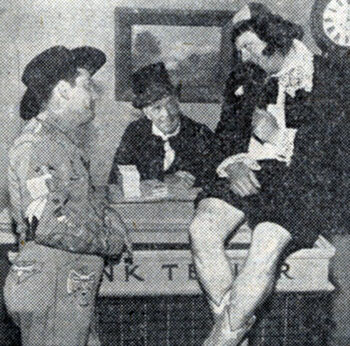 Tex Williams’ KNBH TV sidekicks Smokey Rogers and Deuce Spriggens in a comedy skit with guest star Jack Holt (center). 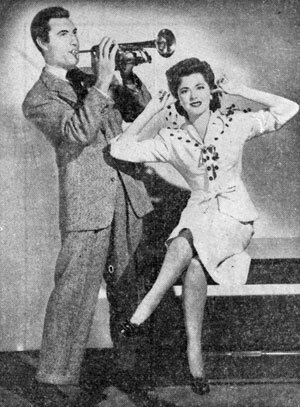 Johnny Mack Brown straightens his tie and gets ready for a day at the studio. 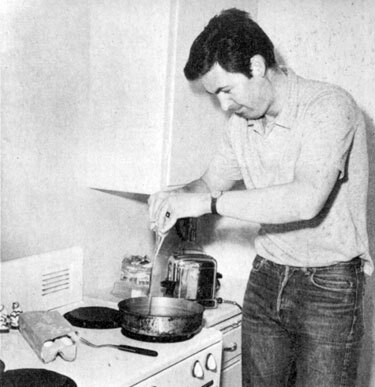 “Davy Crockett”, Fess Parker scrambles an egg to satisfy his hearty appetite. “Man of the Forest” in 1933. 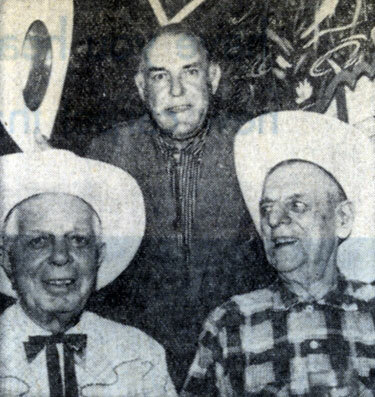 On June 24, 1959 Ken Maynard (top) and Broncho Billy Anderson (right) visited Hoot Gibson while Hooter was making “The Horse Soldiers” with John Wayne. 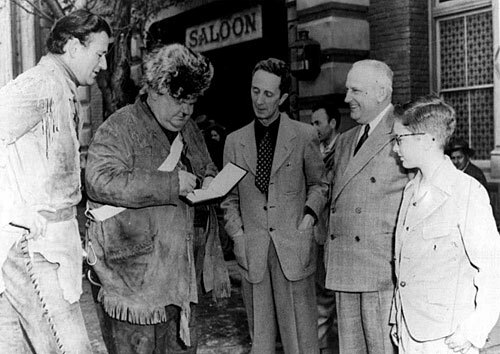 Alongside John Wayne, while making “The Fighting Kentuckian” (‘49), Oliver Hardy signs an autograph for noted artist Norman Rockwell (center). 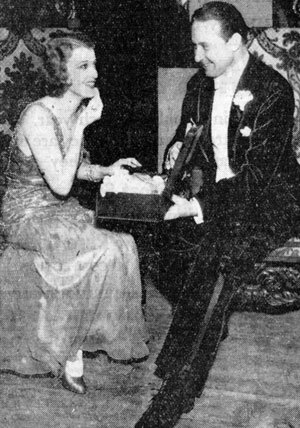 Monte Blue, featured in many Westerns from the silent era on through early television, assists Jeanette McDonald with her makeup before their act went on at the 1931 annual Christmas benefit show at the Shrine Civic Auditorium in L.A.
Out of Western garb in 1942 to make “Orchestra Wives” are George Montgomery and Gene Autry leading lady Ann Rutherford. 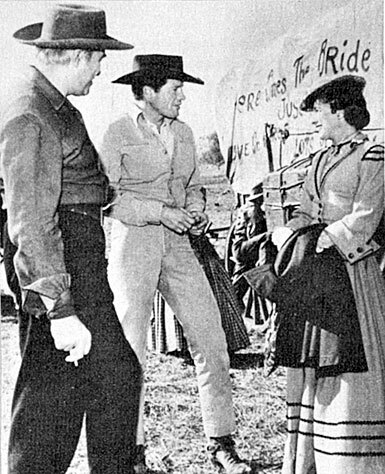 Lorne Greene, Robert Horton and Phyllis Thaxter take a break while filming “Wagon Train: The Vivian Carter Story” (‘59). Gene Autry broke all attendance records with 8,900 people when he brought his show to the Toledo, Ohio Sports Arena April 2, 1948. Roy Rogers trades in Trigger for Jerry Lewis for this comic publicity pose.